I love the simplicity of this image. It is appears as if this little girl is alone on the beach, with her blue kick board, and her beach toys, but then we see hr fathers shadow as he looks over her. I love the color, how the blue kick board brings connects the beach with the sky, and the pink in her bathing suit is the same pink in the buckets. A simple composition but one that has so much to interpret, and it is a great image. I strive with all my documentary sessions, whether they be one hour or an entire day, that I will tell the story of their family, show their personalities and give them a glimps of their life through my lens. Ever session is unique and no family photos will be alike. I also try to create at least one fine art image that I feel should be printed, framed and hung on their wall. Keywords: Best beach photographer (9), candid family photos (6), documentary family photographer (30), hamptons. 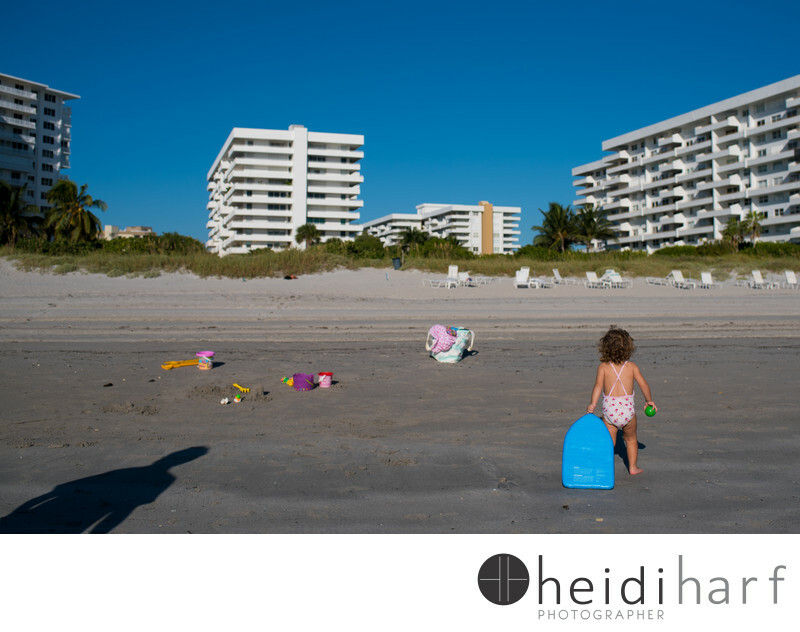 (3), key biscayne beach portraits (3), Miami (3), miami Beach (18), miami beach family photographer (6), New York (36), South Florida (12), South Florida lifestyle photographer (3).